Mini ITX vs Micro ATX vs ATX: What's the Best Choice? Mini ITX vs Micro ATX vs ATX: What’s the Best Choice? Thinking of building a PC? The very first question that arises is which form-factor to choose – Mini ITX vs Micro ATX vs ATX. In this post, I am gonna give a comprehensive answer on what are the differences between each form-factor, their pros & cons and lastly which one is best for you. Let’s find out! Micro ATX is the most common and smart choice for almost all situations with few exceptions. In case you want more than 4 PCIe slots, you should go for ATX while Mini ITX is meant for making fairly powerful compact PCs. Before we go into the technical details and the comparison, let me give a little bit of background about these form-factors for all the beginners reading this. Actually, different motherboards are categorized based on their sizes and features. Mini ITX: With increasing demand for compact PCs, the Mini ITX was released in 2001 which is natively meant for compact low-powered PCs. Today, they are used for building HTPCs as well as Portable PCs. Micro ATX: Prior to Mini ITX, in 1997, the Micro ATX form-factor was released which has its size somewhere in the middle of Mini ITX and ATX. It is a great choice for budget-friendly builds without sacrificing on performance. ATX: The standard ATX form-factor was first developed by Intel in 1995 and it’s still the majorly used motherboard configuration on desktop computers. You can see it on most pre-built PCs. Even the people who love building their own PC builds prefer ATX. Extended ATX: The E-ATX boards were developed to give more scope to power users especially those interested in heavy overclocking, liquid cooling etc. It’s the larger version of ATX and possesses more PCIe slots. Now, let us discuss them in detail in terms of size, RAM capacity, PCIe Slots and Price etc. As you can see from the reference image at the top, a standard ATX motherboard is 12 inches long and 9.6 inches wide (305×244 mm). Its medium-sized cousin, Micro ATX, is rather square in shape with 9.6 inches across length and breadth (244×244 mm). The Mini ITX form-factor is also square but much compact as it spreads just 6.7 inches on both edges i.e 170×170 mm. And, lastly, the Extended ATX (E-ATX) is the largest form-factor with 12 inches by 13 inches size (305×330 mm). After the size, the major difference between these form-factors is the number of RAM slots which defines the maximum RAM capacity of your PC build. While the ATX and Micro ATX motherboards have up to 4 RAM slots, a Mini ITX can only fit up to two RAM slots. That means a mini ITX motherboard can have up to 32GB RAM (2x 16GB kit) while a micro ATX motherboard can have double RAM capacity up to 64GB. And, it can be pushed to 128GB if there’s support for DDR4 RAM modules. E-ATX form-factor, on the other hand, gives more freedom when it comes to memory capacity. Although, for most of the usage conditions, a 32GB memory kit is more than enough; be it high-end gaming or 4K video streaming. BONUS: Check out our handpicked Best Gaming RAM to boost your gaming build to the next level. The PCIe Expansion slots let you install various add-on components such as sound card, graphics card, ethernet card etc. All the three motherboards offer different types of PCIe slots in different numbers. Having up to 7 PCIe slots, ATX leads in this department while others have lesser due to the size limitations. Micro ATX configuration has space for up to 4 PICe slots while Mini ITX motherboards can only fit just one PCIe slot which is generally used to install a GPU. There’s a small issue with Mini ITX boards when it comes to expansion slots. Actually, due to the compact layout, the PCIe slot is generally at the edge and it kind of hinders while installing bulkier GPUs. To compensate for the limited PCIe slots on mini ITX & micro ATX, many manufacturers implement integrated components which is helpful for PC geeks like you. For every form-factor, the manufacturers make the corresponding PC case as well. And, it is a smart choice to buy one according to the size to avoid compatibility issues. It’s understood that Mini ITX cases are smaller and Micro ATX cases are bit larger in size while ATX boards require the full tower cases. These cases are not backward compatible. So, you cannot fit an ATX board in a micro ATX case and vice-versa. Also, the volume of space available inside the PC case lets you install other components like case fans, liquid cooling setup or a gaming power supply etc. Mini ITX cases do not have much space for all the extra components that why it is recommended to use a low profile CPU cooler for mini ITX builds. So, lastly its the cost comes into play. You might be wondering the Mini ITX should be cheapest being the smallest one in size and has very fewer components integrated on the board. But, I have a shocker for you! Actually, the mini ITX boards are the most expensive often while micro ATX is the most budget-friendly option. The reason behind this is the demand-supply constraint. Micro ATX and ATX have more demand so the manufacturers have to compete over price. Also, the cost depends on the quality of the product and brand value. So, it’s a no-brainer that higher quality attracts a higher price. Now that you know what are differences between Mini ITX vs Micro ATX vs ATX along with their pros and cons, the final question arises – Which should you choose? What’s the best for you? Let me give you a comprehensive answer on that. Basically, this choice depends mostly on the requirements that you want to be fulfilled by your ideal PC build. That means whether you want to have an extreme Gaming PC or a powerful PC as a Workstation or a Portable PC. My recommendations for all these cases are as follows. For those who want to build a mid-level gaming PC, I would suggest going with Micro ATX. It gives a great value for money having the potential to install enough RAM, a high-end GPU and even the faster gaming SSD and still not spending a fortune overall. Though most micro ATX builds can be overclocked, in case you want to push to extreme limits, I would recommend an ATX or E-ATX. In recent years, Mini ITX motherboards are being used to build portable gaming PCs but clearly, those are only helpful when portability is the top priority and performance can be sacrificed a bit. BONUS: Want a budget Gaming PC? Check out my list of best Gaming PC under 500 dollars you can buy in 2018. 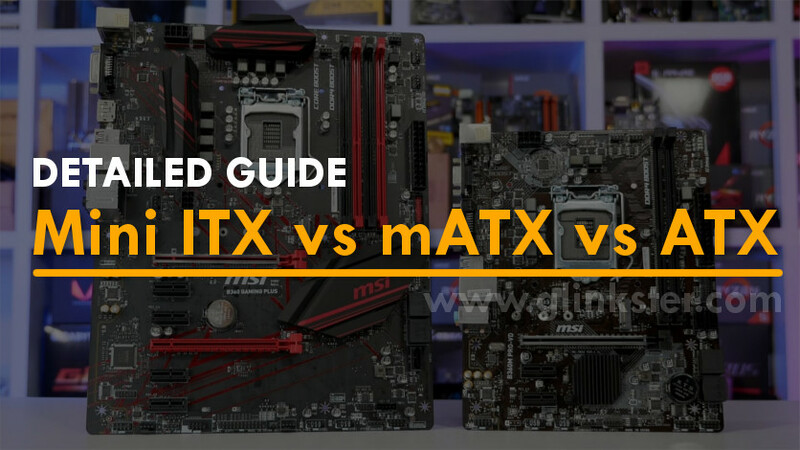 An ATX motherboard is the best choice when it comes to high-performance PC workstations. Actually, there is a solid reason for that – the expansion slots. For a workstation, there could be a need for an Ethernet card, GPU, sound card etc depending on the type of work to be done. And, to have all these on a single board, you need extra slots. Neither mini ITX nor mATX can serve the purpose because of the lesser RAM capacity and heat management issues. You may use a micro ATX if you are on a budget but a mini ITX never for a workstation! Well, that’s what Mini ITX is meant for – a Portable PC or a Home Theatre PC. A Mini ITX motherboard has enough power to play media in their best possible quality and Mini ITX cases also look aesthetically better with your Home theatre system or your TV set. Well, that’s all about the Mini ITX vs Micro ATX vs ATX battle! I believe i was able to explain it well and you can now make a sound choice for yourself. If you found this helpful, please share it with your friends. Have any questions? Drop them in the comments below.